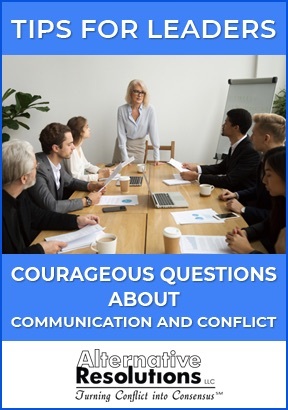 When emotions are running high or you feel threatened or attacked, it can be difficult to take a step back from the conversation or conflict and reflect. It’s easy to continue fueling the conflict and go around in circles, because our emotions build and feed the argument. Defensive communication is our default strategy. However, reflection is a valuable strategy to utilize when trying to deescalate during an argument or avoid escalation prior to a conflict. By employing reflection as a strategy, we learn more about ourselves and the other people involved, and we may find a resolution to a conflict faster because we’ve taken the opportunity to deliberate and think through all sides of the issue. Reflection forces us to slow down and step away from the situation that is causing the issue. Cultivating a habit of reflection can helps prepare for future conflict. We are imperfect beings, and conflict is inevitably going to occur again. But how you handle it, and how you approach the disagreement, can be altered. Reflection can also break the destructive conflict cycle we are all familiar with: something has occurred which made you upset, you react from a space of frustration or anger, and a conflict is born in which both parties wind up hurt and upset. Those feelings are often carried around for a long time, and may never be resolved. By cultivating this habit and reflecting on your own conflict style, the reasons for entering into an argument, and the other party’s perspective for entering the argument, you make it easier to “know the mind of the other”. When we take the time to reflect, we are more likely to make some space within ourselves for understanding the actions, behaviors, and viewpoints of the other. 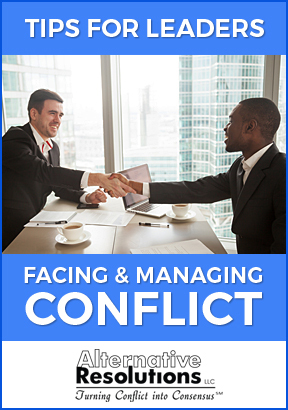 Such an act of mindfulness and respect is likely to strongly discourage conflict behaviors as well as make an opening for understanding “the other” in conflict. Reflection is not about judging yourself for feeling intensely, or giving up on communicating about something that is important to you. It’s about becoming present and aware enough to decide with intention how you want to respond. Reflection is an essential tool managers can integrate to become better supervisors and coworkers. A reflective leader is one who is better able to self-evaluate, perceives how their leadership impacts their team and peers, and knows how to best address conflicts in the workplace. One of the most common sources of business conflicts is inappropriate tone of voice in the workplace. Managers in particular need to be actively aware of their tone as well as body language. When giving a performance review or addressing a conflict, it’s important to ensure that employees and team members don’t misinterpret the message because of a mistake in your tone. A better awareness of your own behavior can help to prevent behavior conflicts in the future, and one step to developing better awareness is through cultivating a practice of daily reflection. By taking time to reflect, the manager is able to go over what is working well and what isn’t, what may have gone wrong, or what strategies were successful and should be utilized again. Reflection can also be used to motivate a team or recharge a team’s collective batteries. Rather than set yourself or a team on a constant drive to push forward, building in time to reflect presents an opportunity to have the team’s questions answered, go over lessons learned, and to share ideas or relevant personal reflections on what that person has learned.